With family coming to town I once again baked up a cheesecake. It has become a tradition to eat cheesecake and drink Margarita each summer when they visit. This year while I was searching for a flavor to make, my Taste Tester suggested a chocolate one with some sort of ‘topping’ and by ‘topping’ he wanted the ganache from one of his all time favorite desserts. I found this recipe on Annie’s Eats and knew it would be perfect. They only changes I made were that I used a different topping. The end result was rich and sinful and so wonderfully smooth. Like all cheesecakes, this is best served after a chill in the fridge for a day or two. If you love chocolate, this is for you, its flavor is more mild than this recipe but still packs a chocolate punch enough to satisfy your craving. To make the crust, preheat the oven to 400˚ F. Line the bottom of a 9-inch springform pan with a round of parchment paper. In a medium bowl combine the cookie crumbs, sugar, and melted butter. Stir with a fork until all the crumbs are moistened. Add the crumb mixture to the springform pan and gently press about 1 inch up the sides of the pan. Press the rest of the crumbs into an even layer over the bottom of the pan. Bake for 10 minutes, then transfer to a wire rack to cool. Reduce the oven temperature to 300˚ F.
To make the filling, combine the sour cream, vanilla, and espresso powder in a small bowl. Whisk to blend and set aside. Melt the chocolate in a double boiler or in the microwave (in short intervals, stirring frequently) until completely smooth. Set aside and let cool slightly. Pour the filling into the cooled crust. Bake until the center jiggles very slightly when nudged, about 50-60 minutes. Transfer to a wire rack to cool for 1-2 hours. Then cover and refrigerate until thoroughly chilled, at least 8 hours or overnight. To make the glaze, place the chopped chocolate in a small heatproof bowl. Bring the cream to a simmer in a small saucepan or in the microwave. Pour over the chocolate and let stand briefly, 1-2 minutes. Whisk just until a smooth ganache has formed. Whisk in the butter until completely incorporated. Pour the glaze in an even layer over the chilled cheesecake. Chill thoroughly. To serve, carefully unmold the sides of the springform. Run a sharp knife under hot water to warm the blade, and wipe dry with a towel. Slice cleanly, wiping the blade between slices and reheating as necessary. Serve chilled. I know the title alone makes you want one of these. I don’t blame you. This dessert takes two of my favorite sweets and combines them perfectly. This is an easy recipe to whip up but does create quite a few dishes and is multi-stepped. You need to make the crust, cheesecake filling and the cookie dough. You could use store bought cookie dough to save some time if you are in a pinch but really, if your making a crust and filling why not just whip up some dough as well (plus you can eat it raw since there are no eggs in it! BONUS!!). 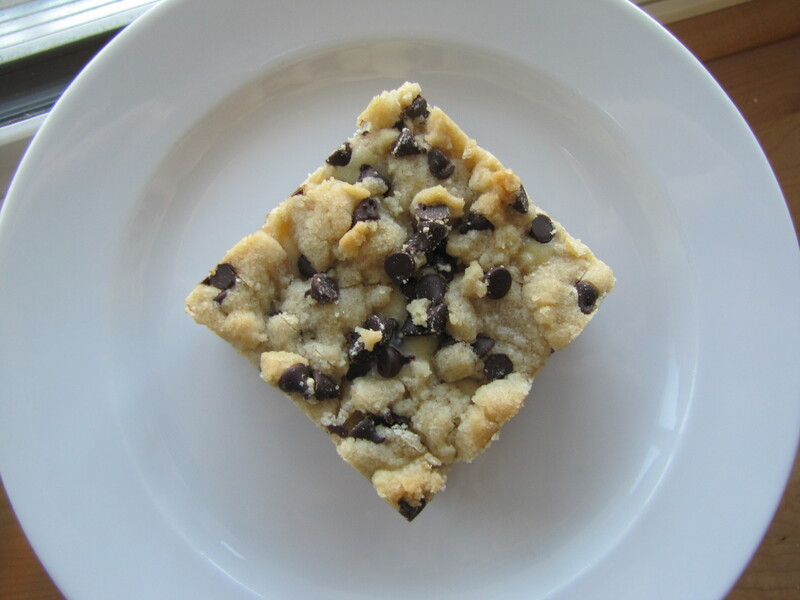 I suggest using mini chocolate chips for the dough as it makes these bars easier to cut and eat, plus you get a little more chocolate in every bite! Yeah! I whipped each component up by hand but you could use a mixer if you want. I found with melted butter and room temperature ingredients there was no need to lug out my stand mixer. If you do make these I suggest making them a day before you need them. Like cheesecakes these get better with a day of rest. I highly recommend eating these chilled (as I do a cheesecake). They will be creamy and crumbly and just so satisfying that a small piece will do. Everyone at work loves these and these were the first to sell out at our bake sale. I think the name draws people in but the flavor kept them coming back for another! I can’t wait to make these for easter using some pretty colored sprinkles and Holiday colored M&M’s on top. How irresistible will that be?? Before easter, I may make these again with some peanut butter cheesecake filling and peanut butter cookie dough. To top it off I think some chopped Reese’s PB cups on top would be phenomenal! If you try it, let me know! Grease a 8×8 pan with butter, line pan with parchment paper and butter the paper, leaving enough to extend over the sides. Crush graham crackers into crumbs to make 1 & 1/2 cups. Add sugar and mix. Stir in butter and mix until crumbs are moistened. Stir in chocolate chips. In a medium bowl stir together the butter, brown sugar, sugar, salt, and vanilla extract at medium until smooth. Gently fold in flour. Mix just until incorporated. Stir in chocolate chips. Set aside. In a small bowl stir cream cheese until soft. Add sugar and stir until smooth. Add egg and vanilla extract, stir just until blended. I wanted to play around with my usual cheesecake recipe. It is a recipe that I have made up after experimenting a bit and trying out a few different recipes (and tasting far too many cheesecakes baked by friends and family). While I like to try new recipes, I tend to fall back on this one time and time again. It has been a while since I have made it and was craving a cool and creamy dessert. I most recently made the Dorie Greenspan cheesecake recipe and while I was pleased with the results, it was just too creamy for my liking (as the name suggests it came out tall and creamy). If that is your thing then I recommend her recipe as the flavor was wonderful. I prefer my cheesecake to be a little more dense and sturdy yet creamy and smooth. While I enjoy plain cheesecake, I wanted to play around with the flavor a bit this go around. After much consideration I decided to try my hand at an almond flavored cheesecake. I took my basic recipe and added chopped almonds to the crust along with almond extract and almond paste to the filling to intensify the flavor. To top it all off I drizzled warm caramel or chocolate over the slices and garnished with toasted Almonds. Overall, I would say that this cheesecake was a success if for no other reason than it was gorgeous, not one crack! The crust provided a nice balance of sweetness and nutiness and was the perfect base for the smooth filling. I had never worked with Almond Paste before and found that the best way to incorporate it into the batter was to great it fine and whirl it in the food processor with the sugar. This ensured the almond paste would get mixed thouroughly into the batter and no clumps of paste would threaten the creamy texture I was after. The flavor of the almond in the finished cake was noticible and pleasant without being overwhelming. I enjoyed it but I am not 100% satisfied so I plan on playing around some more with the flavor. I may cut back on the extract and add some Amaretto to deepen the flavor profile more and reduce some of the ‘artificial’ almond flavor I feel the extract provides. Even though I was not completely sold on the flavor, the texture kept me coming back for more! The nutty crust and creamy cheesecake kept calling my name so, fork in hand, I would happily nosh away. This cheesecake is firm right out of the fridge but is not so solid that you can not cut through each slice with your fork, just smooth and silky goodness. After coming to room temperature it still holds its shape well even when topped with caramel and nuts. I must admit that I do prefer the cold cheesecake best, especially drizzled with warm caramel, fudge and topped with nuts. I highly recommend making this a day or two before serving and garnishing this cheesecake with toasted nuts! Really, though, don’t be afraid to make this your own by mixing up the flavors. For a plain cheesecake omit the almond extract and almond paste and add 1 TBS Vanilla extract with the addition of the 3rd egg. Preheat oven to 300° F. Grease 9-inch springform pan. Fill an oven safe cake pan (I use a 9×9 pan) 3/4 full with warm water. Set on bottom oven rack while oven is preheating. In a medium mixing bowl, combine graham cracker crumbs, sugar, almonds and butter, stir to combine. Press onto bottom and 1 inch up side of prepared pan. Bake in preheated oven for 10 minutes. Remove and increase oven temperature to 350. In the bowl of a food processor pulse the sugar and almond paste until it resembles a course meal. Set aside. In a large mixing bowl beat cream cheese until creamy. Add sweetened condensed milk, sour cream, sugar/almond paste and flour. Beat to combine. Add eggs one at a time beating only to combine after each addition. When adding the third egg, also add the almond extract; beat until combined. Gently pour batter evenly into prebaked crust. Bake in preheated oven for 40-60 minutes or until edge is set and center moves slightly. Watch carefully and do not overbake. Shut oven off and allow cheesecake to cool in oven for 1-4 hours. Run a warm knife around edge of cheesecake after 1 hour. Allow to chill at least 24 hours before serving for best flavor and texture. Let me start by saying how much I missed you guys while taking the month of March off from blogging. I received so many emails with recipes while I was gone that it was hard to decide. 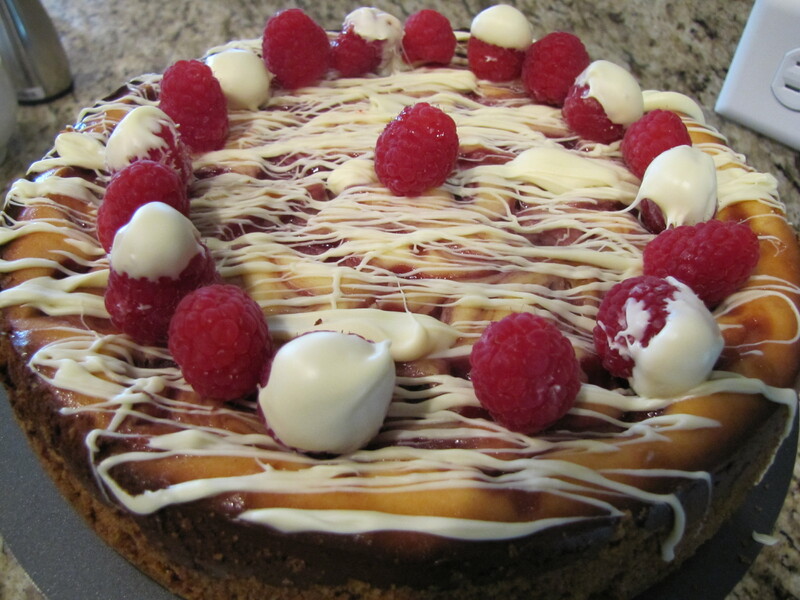 So many people suggested I make another cheesecake and offered up several recipes. Being the lover of cheesecake that I am, I decided to take them up on their suggestion. After careful consideration and looking at several recipes sent to me, I decided to make Dorie’s Tall and Creamy Cheesecake. I have had my eye on this cheesecake for months, ever since the Tuesdays with Dorie bloggers made it. I already have a tried and true cheesecake recipe that I love but wanting to step out of my comfort zone, I was excited to try Dorie’s recipe. The batter comes together in less than 10 minutes but it does require over two hours bake and cooling time, in addition to that, it is best to allow the cheesecake to chill overnight before serving. I feel the taste and texture of a cheesecake only improves over time. I baked it in the afternoon and allowed to chill for a day and a half before trying a slice. Wow, the name describes this cheesecake perfectly. With 2lbs of cream cheese, heavy cream, sour cream and sugar, this dessert is not for the calorie-conscious, but let me tell you, it is so worth the time on the treadmill and a little slice is more than satisfying. The texture is creamy, smooth and rich. It is just what you would want in a cheesecake. The flavor, oh my that flavor! 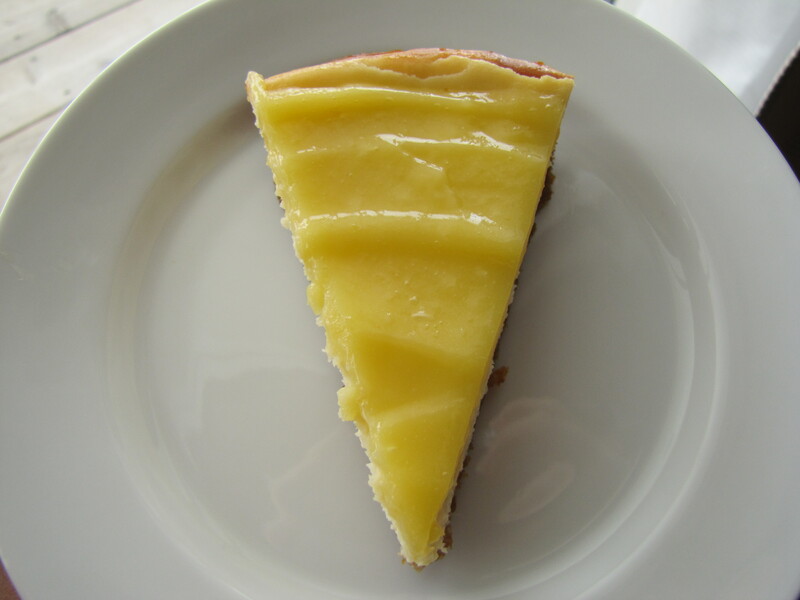 I love the addition of sour cream (which my stand-by recipe does not have) to add a suble tang that excites your tastebuds and pairs beautifully with the sweetness of the crust (and any toppings you may add). I used a water bath and had no problems with cracks except for a few minor ones around the edges. The edges also got a little more brown than what I would have liked for a clean presentation of the plain cheesecake. 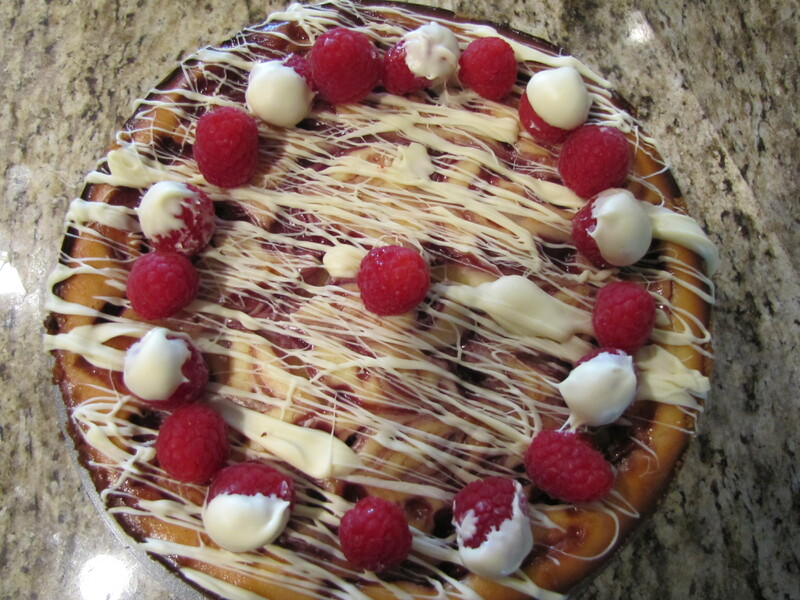 I was serving this by the slice so I added the toppings before serving which eliminated the presentation problem. I would make this again, however I don’t know if this will be my go-to recipe. I really do love my old stand-by and have never had problems with overbrowning or cracking of the edges with that one. Overall, I enjoyed this recipe and encourage you to try it, or at the very least check out the Tuesdays with Dorie bloggers who made it and drool over their pictures and descriptions. Place the springform on a baking sheet. Bake for 10 minutes. Set the crust aside to cool on a rack while you make the cheesecake. Give the batter a few stirs with a rubber spatula, just to make sure that nothing has been left unmixed at the bottom of the bowl, and scrape the batter into the springform pan. The batter will reach the brim of the pan. (If you have a pan with lower sides and have leftover batter, you can bake the batter in a buttered ramekin or small soufflé mold.) Put the roasting pan in the oven and pour enough boiling water into the roaster to come halfway up the sides of the sp ringform pan. Remove the sides of the springform pan— I use a hairdryer to do this (use the dryer to warm the sides of the pan and ever so slightly melt the edges of the cake)—and set the cake, still on the pan’s base, on a serving platter. 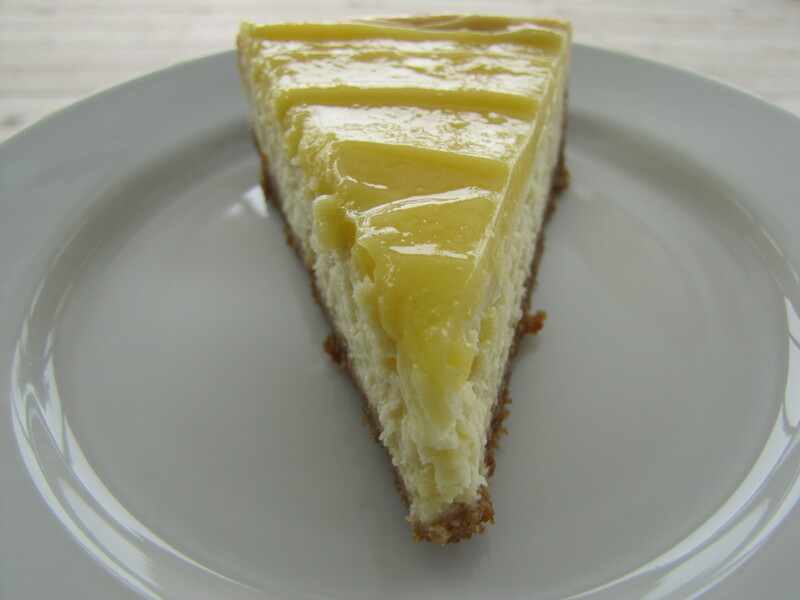 The easiest way to cut cheesecake is to use a long, thin knife that has been run under hot water and lightly wiped. Keep warming the knife as you cut slices of the cake. 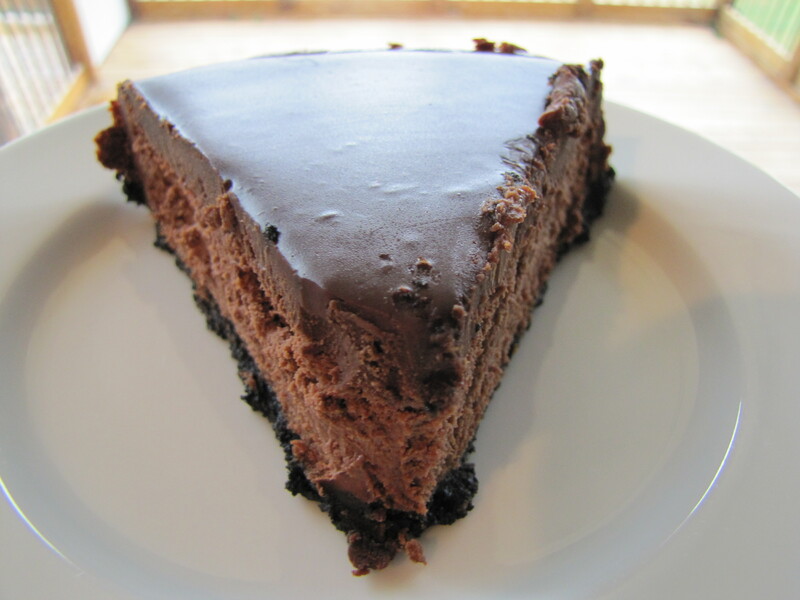 MMM, I do love the combination of Chocolate and Peanut Butter and what better way to enjoy that combination than in a nice and rich, creamy cheesecake? I rarely make cheesecakes, they are not difficult but I find it hard to resist and end up eating way more than my waist and thighs can handle! I needed to bring a dessert to a baby shower this past weekend and knew this would be a hit (I had to grab a pic quick before serving). 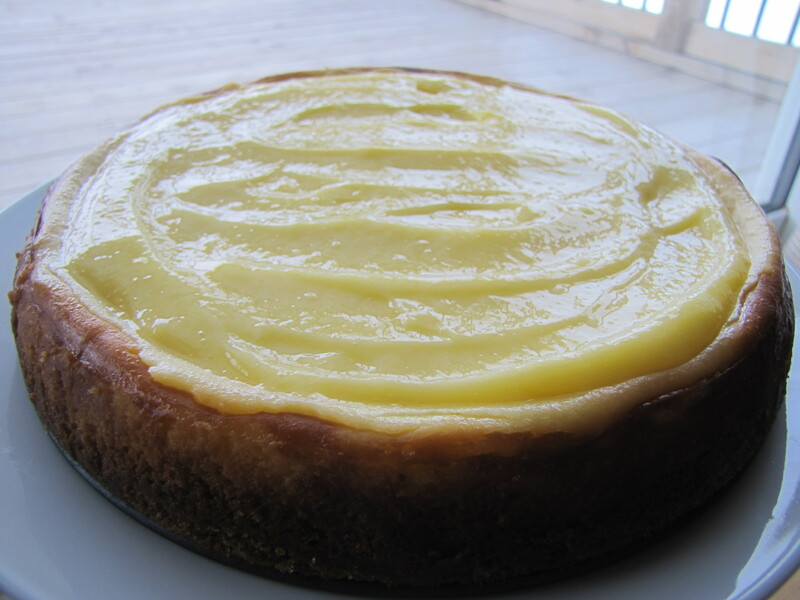 This recipe is so quick and easy, it is based off of this recipe, my go-to cheesecake recipe. After looking online for a tried and true Peanut Butter cheesecake recipe, I decided to make one up on my own. I was very pleased with the end result. The batter was so thick and creamy with a peanut butter flavor that was not overwhelming. It baked up beautifully and did not crack a bit! After chilling for 24 hours I tasted this wonderous creation. 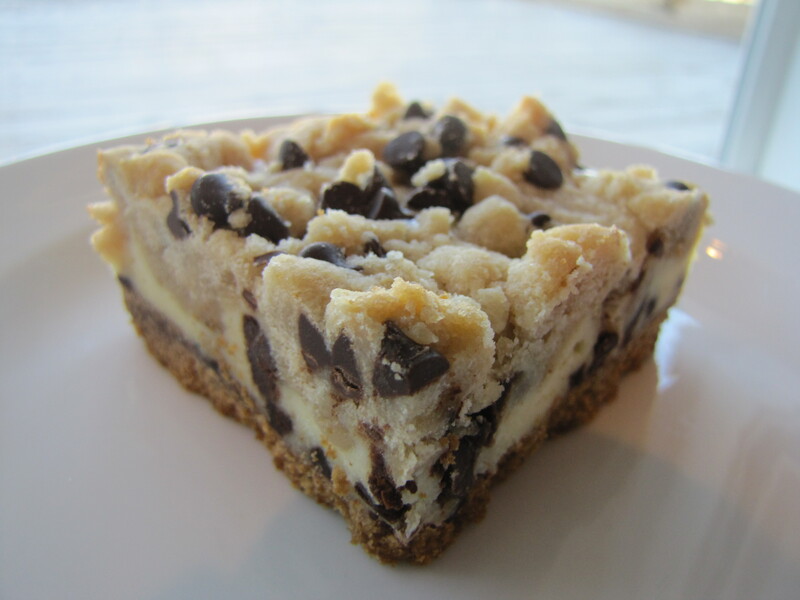 So rich and creamy with a light Peanut Butter flavor that complimented the chocolate cookie crust perfectly. I loved the layer of Peanut Butter and Chocolate between the crust and the cheesecake and enhanced the flavors perfectly. My only complaint is that the crust crumbled a bit more at the tips of the cut pieces than what I would want for serving company. It may have been my fault though because I pried up the cut pieces with a fork (possibly breaking the crust in the process). It still tasted wonderful, just not the best presentation. Next time I might dress this up a bit with chopped Reese’s Peanut Butter Cups and a milk chocolate drizzle before serving. In a medium mixing bowl, combine Oreo crumbs and butter, stir to combine. Press onto bottom and 1 inch up side of prepared pan. Spread 1/3 cup softened peanut butter over the crust and evenly sprinkle the chocolate chips over the peanut butter layer. Set aside. In a large mixing bowl beat cream cheese until creamy. Add sweetened con densed milk and peanut butter and beat until smooth. Add sugar and flour, beat to combine. Add eggs one at a time beating only to combine after each addition. When adding the third egg, also add the vanilla extract; beat until combined. Gently pour batter evenly into prebaked crust, peanut butter and chocolate chips. Bake in preheated oven for 45-60 minutes or until edge is set and center moves slightly. Watch carefully and do not overbake.